My wife had ancestors who were based around the West Cornwall town of Redruth. 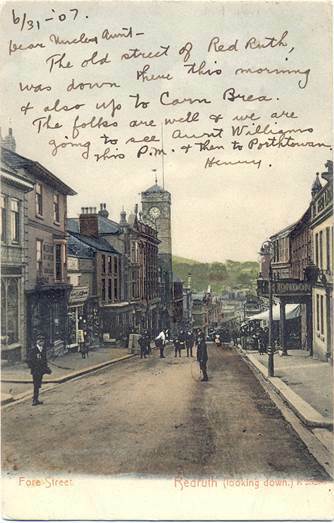 We are looking at a non-family postcard today which shows what we may call a significant area of Redruth and has a message which is just possibly family related. Fore Street is the main road through Redruth. It might, perhaps have been called high Street, for it is like ‘High Street’ in other towns. The street, as we can see in this Edwardian image, is lined with shops and inns. And a clock tower stands tall above the other buildings. This picture is just slightly annoying to us, for at the extreme left hand edge we have a little portion of the shop which great grandfather, William Hall had. He died in 1907 and he had not been a draper all his life. He had been, like many a West Cornishman, a miner and as with many other miners he had spent time abroad to seek his fortune. And maybe he found enough of one to come back and give up the pick and shovel for the more peaceful life of a draper with his own business. Now let’s look at that message, remembering that post cards, in the Edwardian era, were very much like the text message of today. The old street of Red Ruth. Was down there this morning and also up to Carn Brea. The folks are well and we are going to see Aunt Williams this pm and then to Porthtowan. Could any of this mean our relatives? Well, William Hall’s wife had been a Williams – Grace Williams – so it could be. But Williams is a very common Cornish surname. Now let’s see where the card was going. 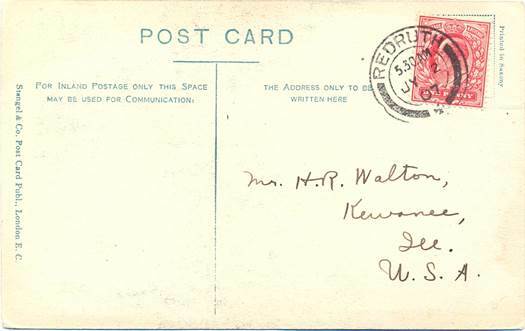 It was sent on 2nd July 1907 from Redruth to Mr H R Walton in Kewanee in the USA. I could almost get excited here for Great Grandad had brothers in Keweenah but that is in Michigan – quite a different place from the Illinois town this card went to. From US censuses I think the recipient was a Hercules R Walton who had been born in Illinois in 1855. I know of no link to our family. The post card is still lovely – but if only it showed more of great grandfather’s shop! I don’t think it’s any secret that I like clocks. Most of my collection are family pieces, having come from grandfather, father, great aunt and mother-in-law. They are all ‘proper’ clocks with lovely geared clockwork mechanisms. But I have nothing against the modern clock fitted with a quartz mechanism. In fact there are plenty of them around the house. A couple of years ago I acquired this one – a sort of kit clock – second hand at a sale. Despite its rather naff modernity, I love it. There’s not a scrap of traditional clock in this. The base is plastic the clock décor, representing a rather psychedelic hippo is made of brightly coloured foam. Hippo waggles his head from side to side and wags his tail. It really is quite fun. 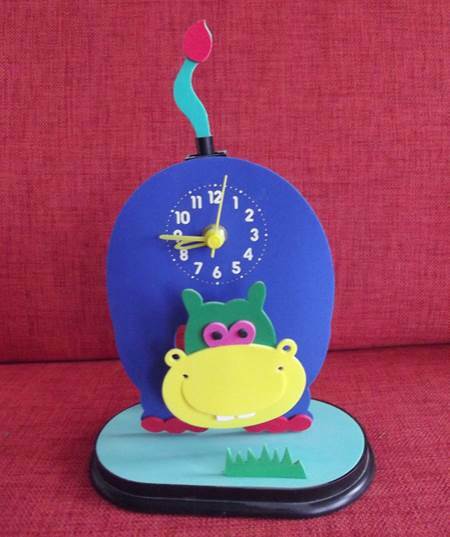 Hiding behind hippo’s blue body is a quartz mechanism – they are small and cheap making the possession of many clocks relatively affordable. The head and tail may act like a pendulum, but they have nothing to do with the regulation of the clock. That’s down to the quartz crystal. The power, of course, comes from an AA battery. By the way, I find that when my camera decides its AA batteries are dead, they’ll still do a year driving a quartz clock. I wonder if silly clocks like this one will excite antique hunters of the future. Many of my grandfather’s photos, which came to me in negative form, are of people – family and friends. Just a few are of landmarks and buildings and here is one of them. It is of Hoad’s Mill in Bexhill. Although I have but a negative, I can date this photo to around 1928. I’m pretty certain that’s my Aunty Dora in the photo. Grandad has captured a fine post mill which, alas, is no more. I shall quote some of its history from http://www.sussexmillsgroup.org.uk/bexhill.htm – web site of the Sussex Mills Group. Hoad’s Mill was a post mill built by a millwright called Plumley and documented 1784, but believed to have been built earlier. Mr Fuller, for whom the mill was built, was recorded here in 1820. Brothers James and Thomas Hoad worked for Mr David Page from 1884 and took on the mill in 1887. Shortly after, Thomas went to work at East Hoathly on his own account as a baker, leaving James Hoad. The mill remained in ownership of the Hoad family until 1965 when the whole body collapsed, leaving the trestle and roundhouse. 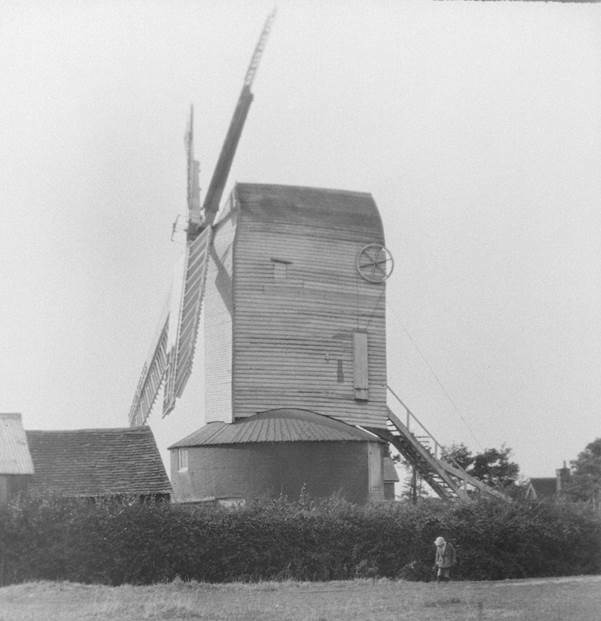 More information can be found at the Bexhill Bygones site at http://www2.bexhilltoday.co.uk/custom_pages/bygones/pages/03-17/hoads_mill.htm. It’s worth visiting that site for a photo of the collapsed mill with Mr Hoad surveying the wreckage. I can remember the mill, long since out of use, but still standing, back in the early 60s when I used to stay with grandparents. 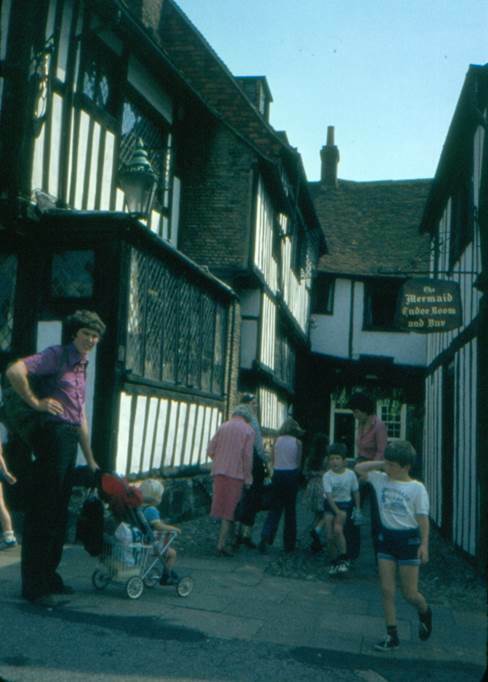 On a trip to Rye back in 1979 we were tourists on holiday. It was a cheap holiday. We stayed with Grandma and purchased a week’s worth of rail rover tickets for an area in Sussex. Rye was available on our tickets so we went. Using the old Canon Demi camera we recorded a few tourist landmarks. One of the town gates – I’m not sure which. That’s a very youthful me on the left, pushing my even more youthful son in his pushchair. That was about his last push, for later in the day a wheel fell off the chair and from then on he had to walk. Oh, it’s the much photographed Mermaid Inn. 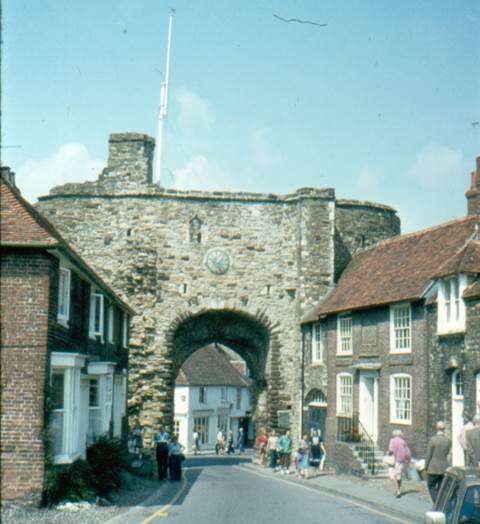 When we visited in 2006, we were still tourists, of course, but now we were genealogy tourists for I had discovered that a four greats grandfather had lived in Rye. His name was Henry Huggett and he was born in 1788 at nearby Peasmarsh. He was a carpenter and only moved into Rye in later life. 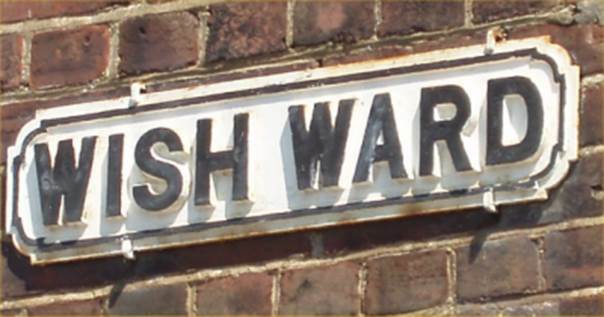 He lived on a street which was called, delightfully, ‘Wish Ward’. Henry lived at number 1 and here it is. It’s the humble home with the blue door. Henry’s son, also Henry who was the brother of my direct ancestor now ran the carpentry business and he lived nearby. This is his house. 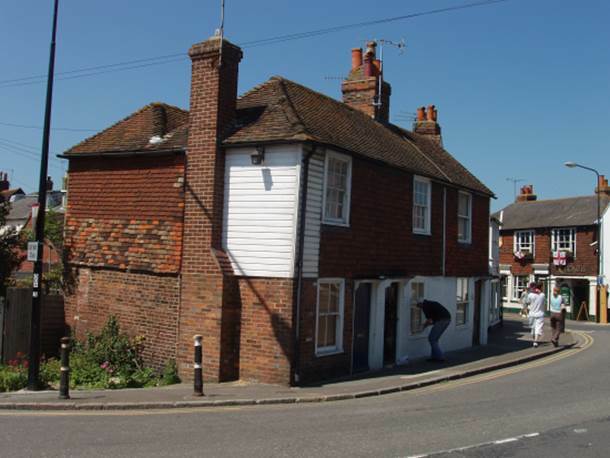 It’s the second, white fronted house we see – the one getting a lick of paint. It’s on Ferry Road. 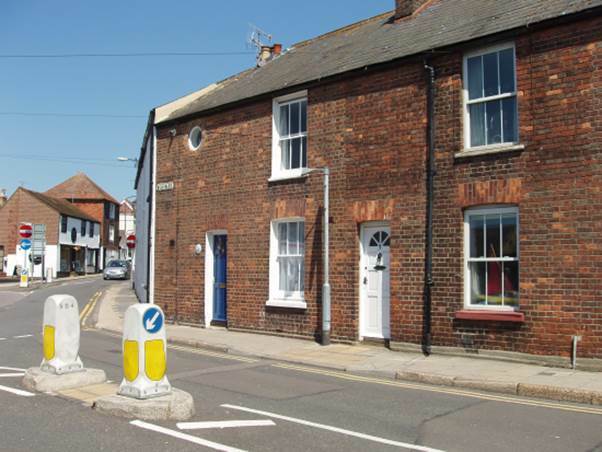 Being a genealogy tourist in Rye gave us a whole new perspective on the place as we trudged the back streets, away from Mermaid Street and the tourist areas – albeit barely 100 yards away. Like anywhere else, Rye’s origins were not in being a pretty tourist town. It was a working place, with access to the sea and where real people did real jobs. We have met my love of the Cornish mine engines before on this blog – the Coates mine engine is in a dramatic situation right on the coast. The view we’ll look at today is less dramatic, perhaps, and the mine engine is away in the distance for the foreground is occupied by a stone monument which is much older. 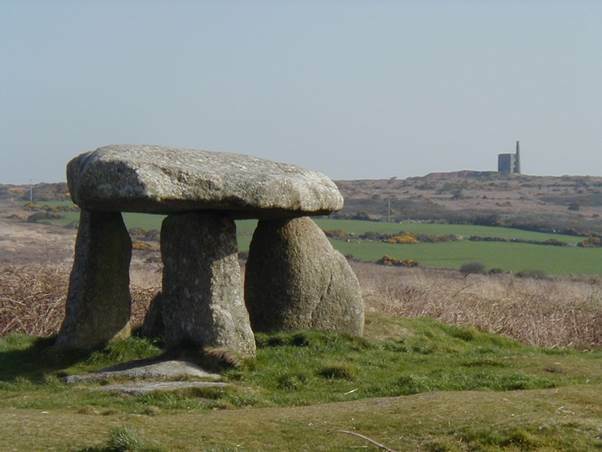 This is Lanyon Quoit and my photo dates from the spring of 2003. Lanyon Quoit is believed to be some kind of burial chamber and it dates from between 2500 and 3500 BC – so it is somewhere around 5000 years old. But what you see is not what our forebears saw back then. The quoit as described in the 18th century is very different from today’s structure. It must have been an amazing storm, in 1815, which removed the thirteen ton cap stone and caused others to break. When it was re-erected it was half the height of the former structure, differently oriented and it had lost one of its four legs. The mine engine is at the delightfully named Ding Dong mine complex. The mines (not the engine house) are thought to be the oldest in Cornwall. They probably have a 2000 year history. So we have two iconic features of Cornwall in one shot. Many years ago my father with his second wife and young family rented a cottage in the little Welsh village of Abergwesyn. They had a problem. Their car gear box failed and guess what? British Leyland were on strike and so there was no chance of a new one. They extended a holiday until the next lot of visitors were due and still there was no car for them. We were asked to go on a mission of mercy and rescue them. We could stay overnight by camping in the garden at The Post Office. Our love affair with that part of Wales began. It is a glorious, still unspoilt area and if ever we are heading out that way, we’ll find an excuse to travel through Abergwesyn and take the road on to Tregaron. It must have been around 1974 for I have a photo I took of my half-sister in the Post Office garden. She was born in 1973. The man who had the Post Office was called Dai Jones. He was as Welsh as could be and an absolutely delightful man. He had so much knowledge of all sorts; the sort of knowledge that people who stay hefted to one area get. It is so much deeper than the quick overview of the traveller, on a mind broadening experience. Travellers often consider men like Dai to be shallow but I wouldn’t wish to favour one way of life over another. Or maybe I would, by saying for me the deep knowledge is more what I go for, but balance it with some travel. It was always good to call on Dai after that initial visit. We’d be sure of a warm welcome and could catch up on his news whilst he listened to ours. 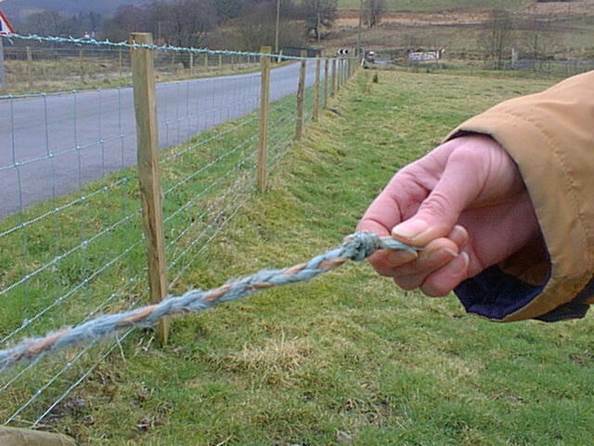 One of the little things that Dai did was platting binder or baler twine into a rope. It was wonderful, when visiting the area in the year 2000, years after Dai had passed on, to come across a bit of Dai Jones rope. This length was being used to fasten a gate. Wonderful! Let’s have a bit of fairly local scenery to end with. 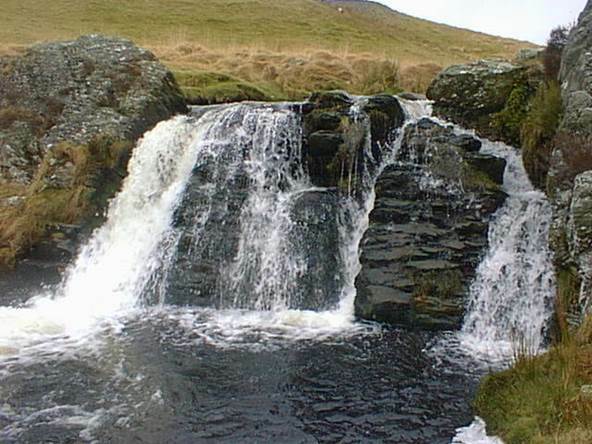 This waterfall is by a junction with the road down to Llyn Brianne – where stands the loneliest telephone box I know. It must be time to travel again. I’d like to get back there! My wife is a pretty good French speaker and likes the chance to use her language. 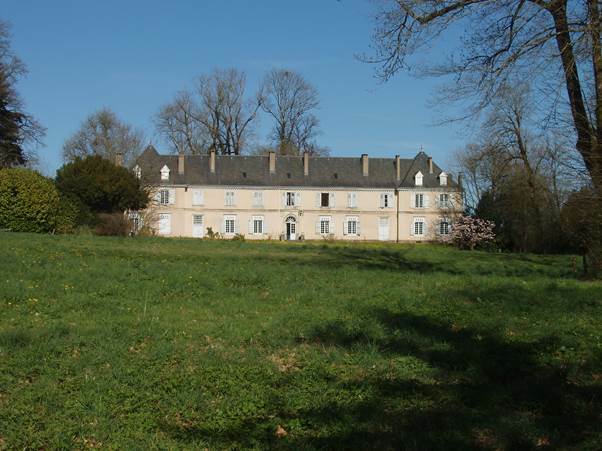 So, from time to time we abandon the tent and use a bed and breakfast in France. We have a now elderly Gite de France bed and breakfast book. It is huge, has thousands of potential B and Bs but is in French. When we get to an area we might stay, we open the book and try to find a suitable place. Our priorities are a cheap price and the presence of a kitchen for guests to use. That way we can cook our own evening meal and avoid the expense of eating out. Our food will be French, purchased locally in a supermarket or hypermarket. Back in 2008 we were heading south in early April, with every intention of getting the tent up at some point. But we looked for a B and B and found one which seemed to fit the bill. My wife phoned and it seemed confused – particularly with regard to cooking facilities but, assured we could cook, we booked in. 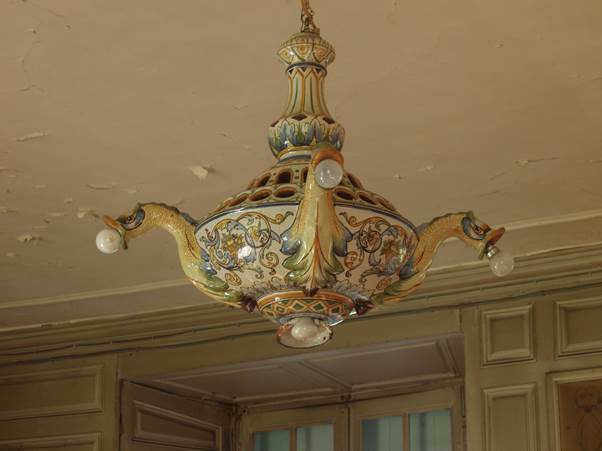 It was in a chateau at St. Martin Sepert. 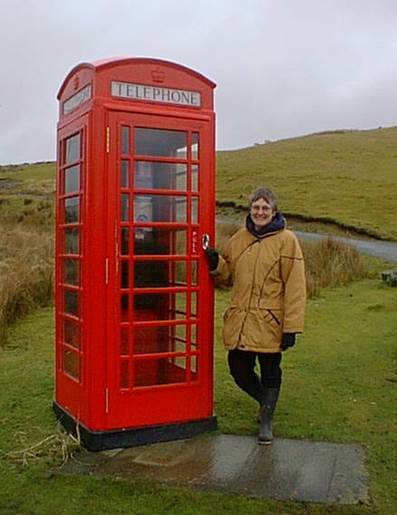 On arrival, we needed the loo – but no chance of that. We had to do a tour of the grounds – in particular to see the beehives. Then we had to do a tour of the chateau which had all sorts of oddities. 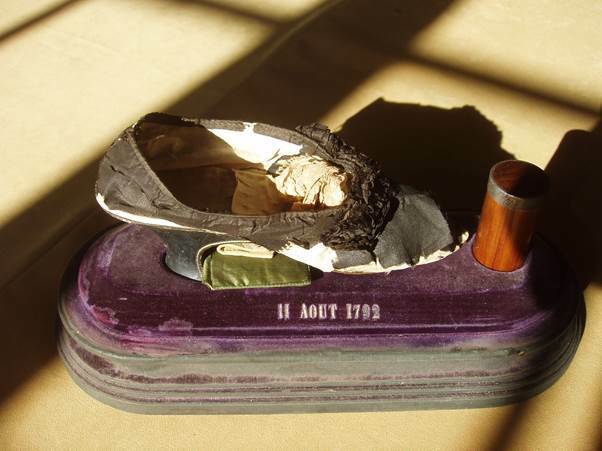 This was said to be Marie Antoinette’s slipper, which fell off her foot as she walked to the guillotine. An electrical fitting caught my eye. We finally got shown our room which was fine. And we understood the cooking problem. They had had a kitchen for guests, but it had burned down. But we could use Madame’s kitchen. This was not the kitchen on the scale of that at Hampton Court which we had seen on our tour, but a modern, smaller one. We cooked and enjoyed our simple meal before walking the village and then enjoying a sunset. Sometimes your luck is in. 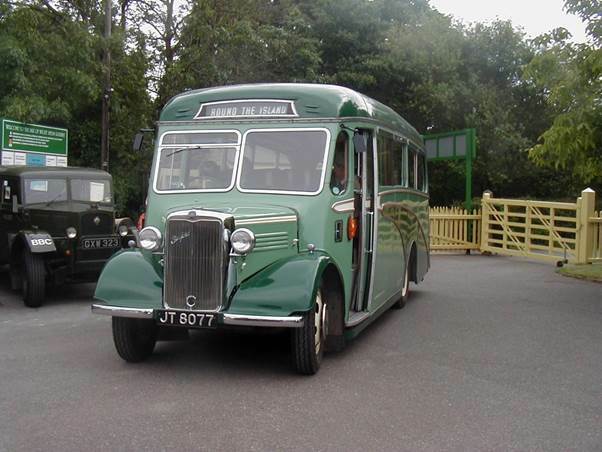 When we travelled on the Isle of Wight Steam Railway back in July 2004 it was a 1940s themed day. The railway, of course, is utterly delightful. It forms a part of the line between Ryde and Newport and on to Cowes and that was a route I knew and loved from train spotting days. But with the added 1940s theme it was a wonderful day even for non railway nerds. We can start in the forecourt at Haven Street where supporting vehicles were available to admire. I do not know if bus trips were available, but I expect they were. What a fine vehicle with an interesting history. She was new in 1937 and I quote from http://onlineweb.com/buses-coaches/JT%208077.htm. This Bedford WTB with Duple coachwork was new to South Dorset Coaches at Corfe Castle in Dorset, and stayed with the company for thirty years. 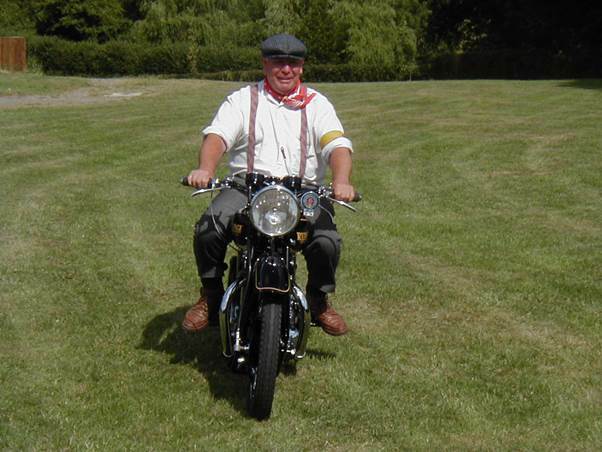 It then passed to Adge Cutler of The Wurzels, who used her for band transport, but he was also interested in vintage vehicles, and took her to a number of rallies, including the London to Brighton Historic Commercial vehicle Run. 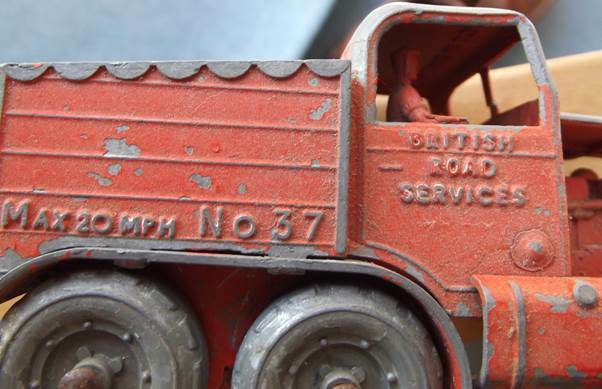 Following Adge’s untimely death, she passed to new owners in Gloucestershire in the mid 1970s. She became semi derelict before passing to Pearce, Darch & Willcox, at Cattistock in Dorset who restored her, and recertified her as a PSV in 1987. 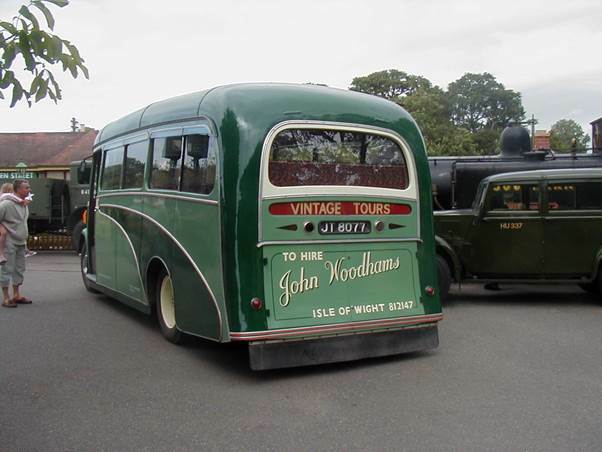 After two or three years the company and its modern coaches sold out to Southern National, but JT 8077 remained in the old garage until 1992 when acquired by John Woodhams Vintage Tours in Ryde, Isle of Wight. Very few WTBs survive today, and JT 8077 is the only known example in passenger service. On the railway there was a demo ammunition train which pootled about. But it was the extras which made the day for me. 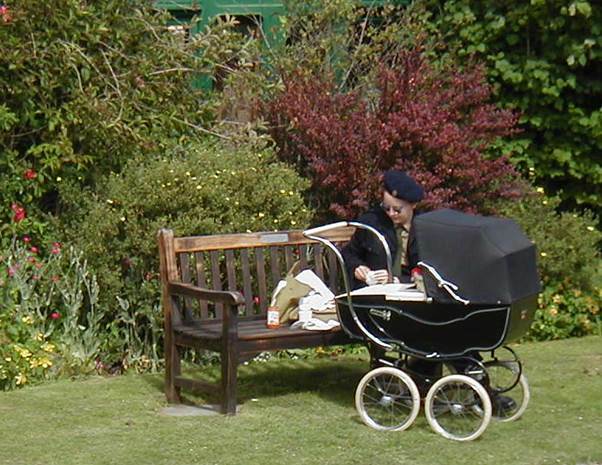 A 1940s lady, complete with pram, enjoys a picnic. 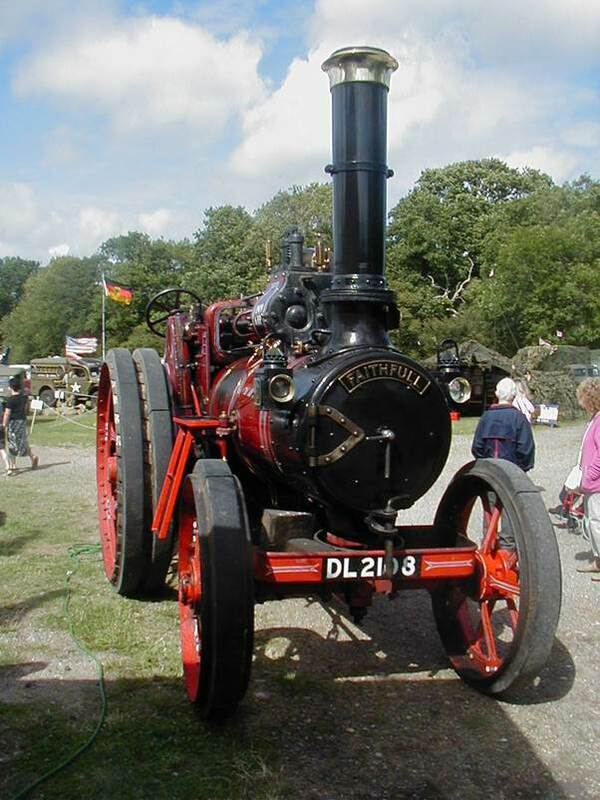 This is a 1909 Marshall steam traction engine. 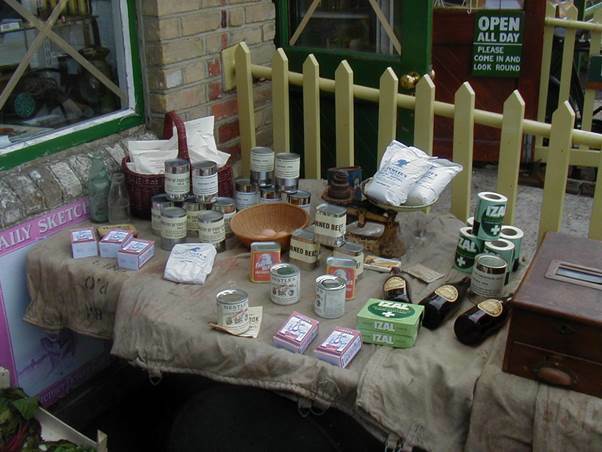 A display of 1940s goods as a kind of shop counter. But now you’ll have to forgive my nerdism. The Isle of Wight line has two of my favourite class of loco. Neither were in steam, but they are still fantastic engines. They are the 1872 designed A1x class of the old London Brighton and South Coast Railway – always known as Terriers. Quite a few were still operating in the 1960s. They had spent working life time on the island so there is a rightness about them being there. 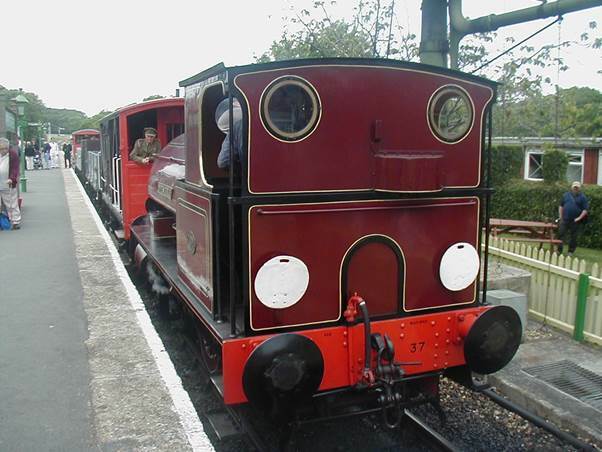 Number 11 was sold by the Brighton company and used on the Isle of Wight. 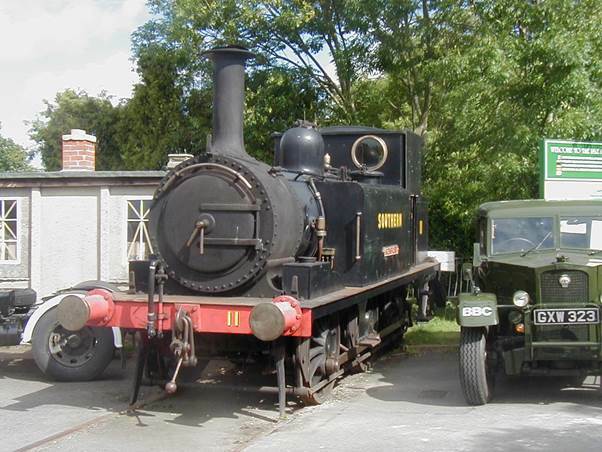 She returned to the mainland and survived until 1963 when Butlins bought her as a static exhibit at Pwllheli. 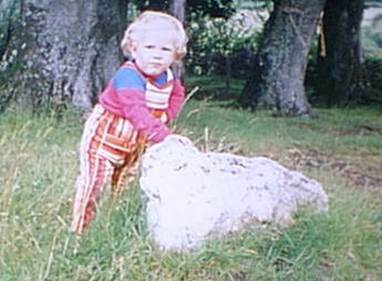 She returned to the island in 1972. 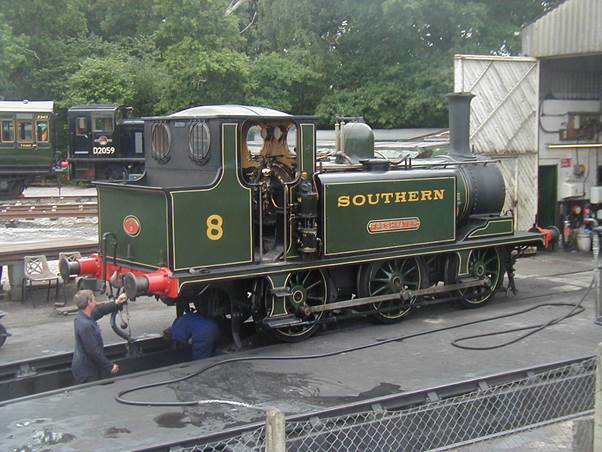 Number 8 was also used on the Isle of Wight for many years before returning to the mainland. She was withdrawn in 1963 and became a pub sign on Hayling Island before arrival back on THE island in 1979. 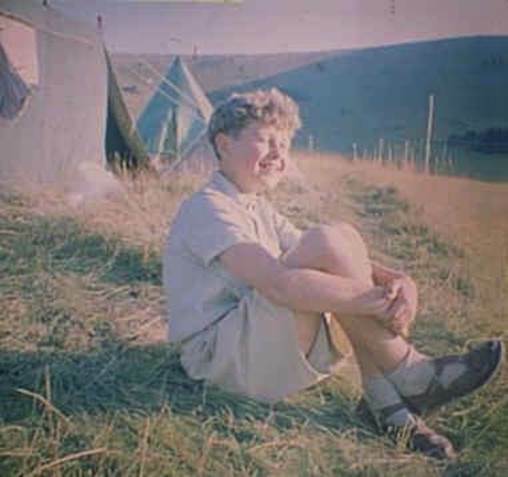 My brother, who died as a young man in 1980, sits and enjoys the summer sun on our little ledge on the South Downs twixt Lewes and Eastbourne. 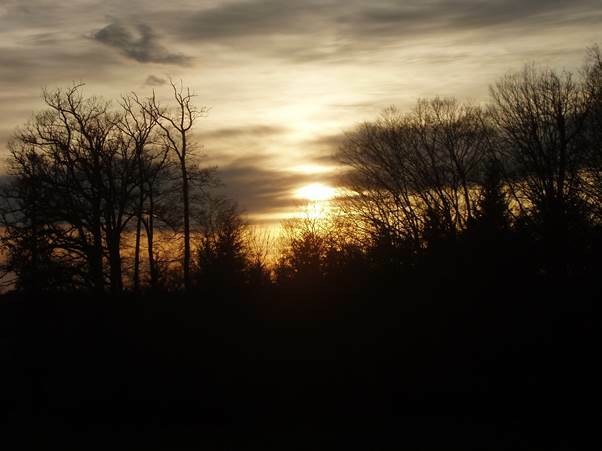 So many memories are stirred by pictures of our camping holidays – almost all of them pleasant. Today I recall something I shouldn’t be proud of but honestly, no cruelty was intended although I still feel just a tad guilty and I’m not disclosing the name of a neighbour at home. One evening, we three children were in bed and my sister challenged us all to say the funniest thing we could think of. After a while, I just said the name of the neighbour – ‘Mrs S_____’. Absolute uncontrolled hysterics followed from all three of us. My brother had a wild and outrageous laugh and it was the photo of him with the cheery grin that brought this to mind. But the three of us just laughed and laughed and laughed. After a while parents appeared, demanding to know what was so funny. But we were still convulsed with laughter and were unable to tell them. I know my brother tried to tell them, but he sounded like a lunatic with a stutter and never got beyond, ‘M M M Mrs’, before the uncontrolled laughter began again. Eventually, some order was regained and one of us was able to blurt out the subject of our humour. But with the name said, the awful hysterics set in again. It was late into the night when we settled down to sleep. And of course the awful thing is that Mrs S____ was just a lovely lady. She and her husband had two pleasant children and I was quite friendly with the girl of about my age. She just did not deserve the awful humiliation of three kids roaring with laughter over her name. I imagine nobody ever told her. But can I humbly apologise for such an awful wrong which I dreamt up – of saying her name as the funniest thing I could. 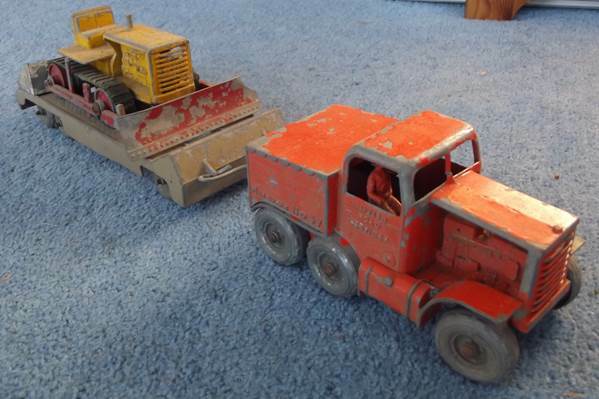 One day and I can’t remember quite when – probably about 1955 – my dad came home from work with the most magnificent toy for me. 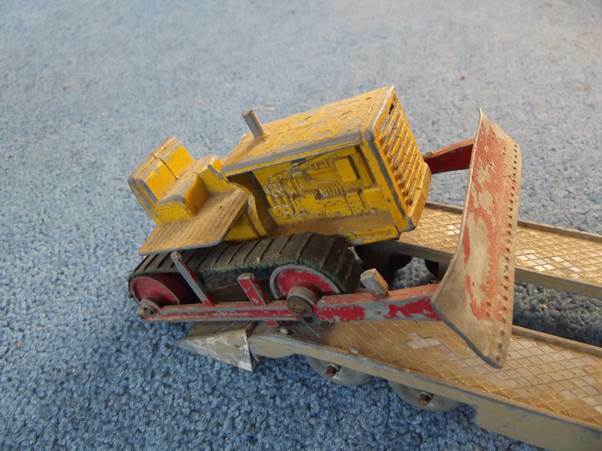 It was a Lesney prime mover with trailer and caterpillar bulldozer. If you put them all together it is about 12 inches long. This toy of mine was much loved and much played with. It worked out in the garden, moving earth – really where it belonged. Mind you, I have just been looking it up on the web and I find near mint examples with box now market for well over £1000. Value is not my concern, but mine must be way below that with all its faults and missing pieces and a complete absence of box. The power unit, or prime mover, should have green engine covers on each side. Sadly they are gone. The back wheels no longer stay attached to the body – a minor problem which could be rectified easily. But other than that it’s wonderful. Look, it had a driver (painted all over orange like the rest of the bodywork. 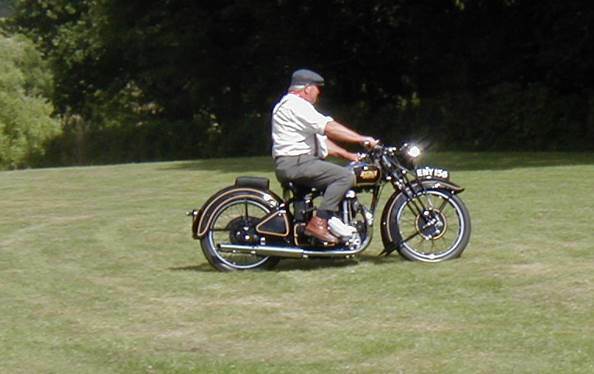 And it purported to be in the fleet of British Road Services. I read that it was loosely based on a Scammell. The ramps at the back of the trailer could be put in place for loading and unloading the bulldozer. My trailer’s tow bar vanished many a year ago and was replaced by twisted wire. Bits of ‘hydraulic’ equipment on the caterpillar vehicle have broken off. The prime mover gives no indication as to maker, but the bulldozer and trailer both do. There’s the maker’s name on the back of the ‘pusher’. This shot reveals that a bit of this pusher has broken off. The trailer – which clearly has a bent axle – also carries the maker’s name. So, in fact, what I have here is a well-loved wreck.